Things started out a little bit slow (by comparison to the way they finished), but we saw a couple humpbacks moving sporadically near Shelter Island. 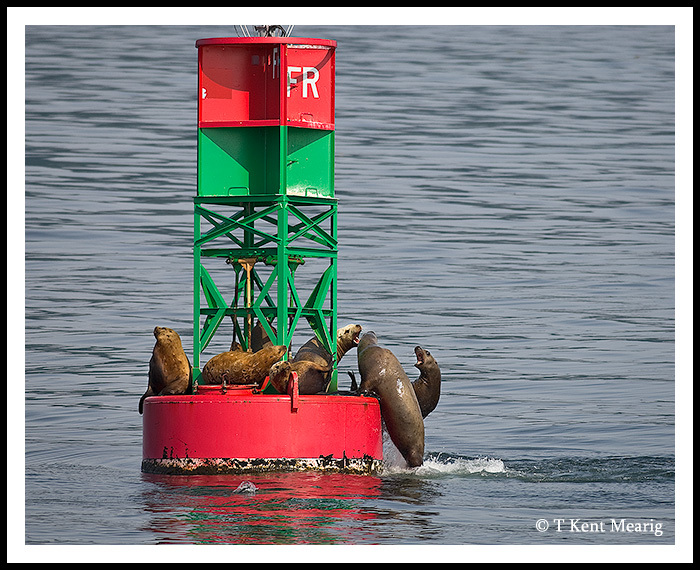 They’re unpredictable pattern of movement made it hard for the boat to get us very close, so we stopped to watch some sea lions lounging on a buoy. They put on a bit of a show by playing “king of the mountain”, trying to get a spot in the sun. Our captain got a call from one of our vessel’s sister ships, and we headed south to where there were a group of whales traveling together. That’s unusual behavior for humpbacks, but I’ll get into that more later. 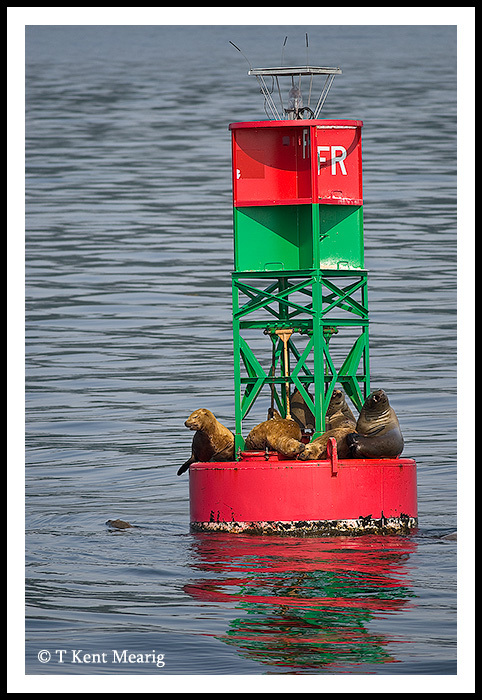 As we approached, the group seemed to be splitting up, but the star of the group hung around to show off for a while. A baby humpback can’t dive and feed like adults, so when mom is getting something to eat, the little one has to find ways to amuse herself. 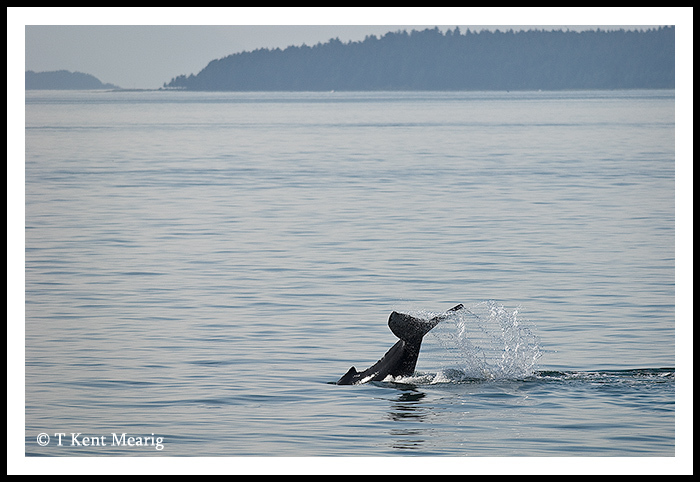 It was amusing for us too; as she thrashed her body near the surface, splashed with her tail, and waved her pectoral fins in the air. But that was only the beginning of what was in store for us. 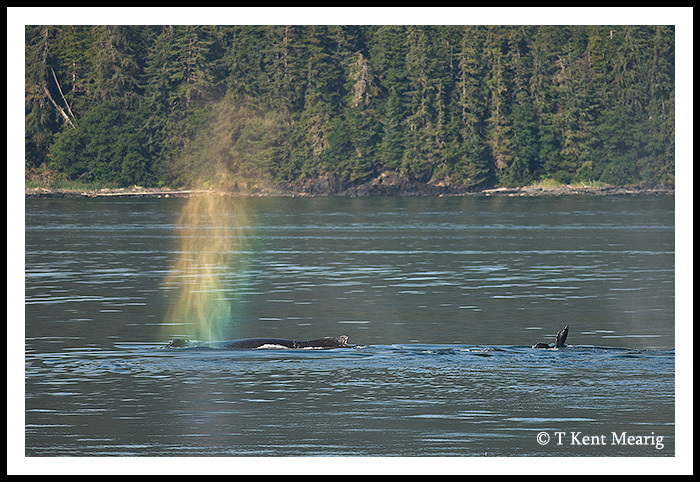 Leaving the dissipating whales behind, we were on the move again to check on a second cluster. This group had bubble net feeding going full swing! It isn’t the first time I’ve seen the behavior (the other time was from a kayak), but no one could ever get enough of it. Bubble net feeding is something you really have to see to believe. Not only is the behavior itself incredibly fascinating as a concept, it provides some of the most above water exposure of the whale’s bodies other than a full breach. 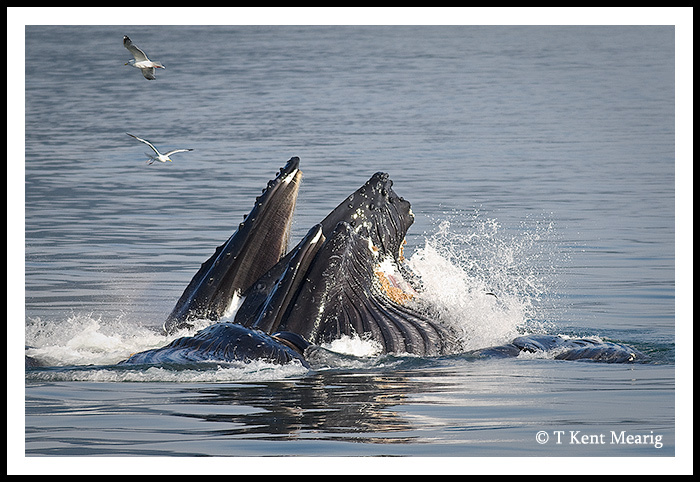 For instance, the pink strips you see in the mouths of the whales in the following photo are their two ton tongues. I learned some new things about bubble net feeding from the naturalist on board our ship. The most interesting of which was that this behavior has only been happening since the late 1980’s. 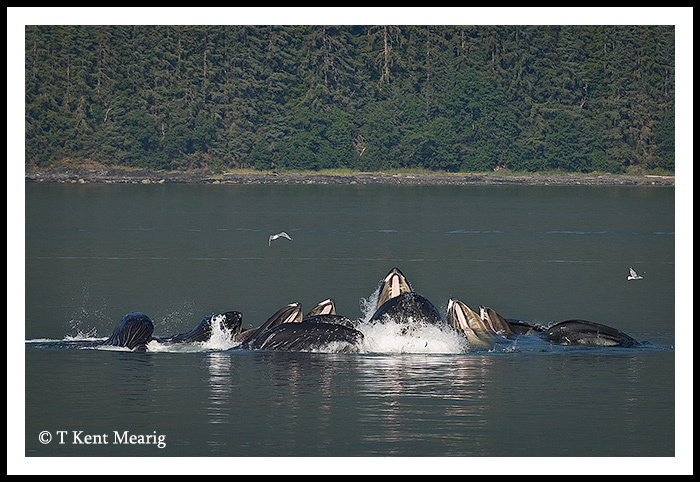 No whaling log mentions a group feeding behavior of any kind among humpbacks before that point. I joked with Breea that God must have pulled aside a handful of the lady whales and laid out the new plan for getting more food. Since humpback whales are on the endangered species list, it was like His very own “save the wales” campaign. All joking aside, I don’t expect there are any more reasonable explanations. It also turns out that research points to there being only six females in the whole world that can orchestrate a bubble net group, and when they’re around, just about any whale can join them. The lead female does an audible call to get things started, and then the bubble blower begins swimming in a spiral while releasing air from it’s spout. Herring, a schooling fish and the intended prey, can’t swim past the tight ring of bubbles, and by the time they turn around, the bubbling whale has circled behind them as well. 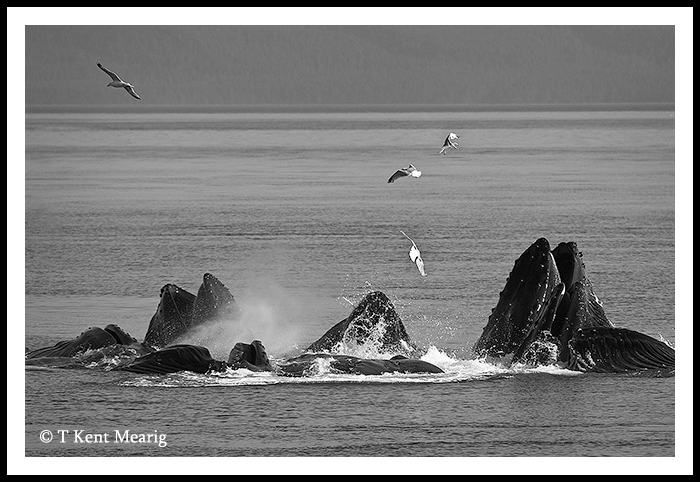 At this point, the rest of the whales are charging up through the middle of the bubble ring, forcing the herring toward the surface of the water. 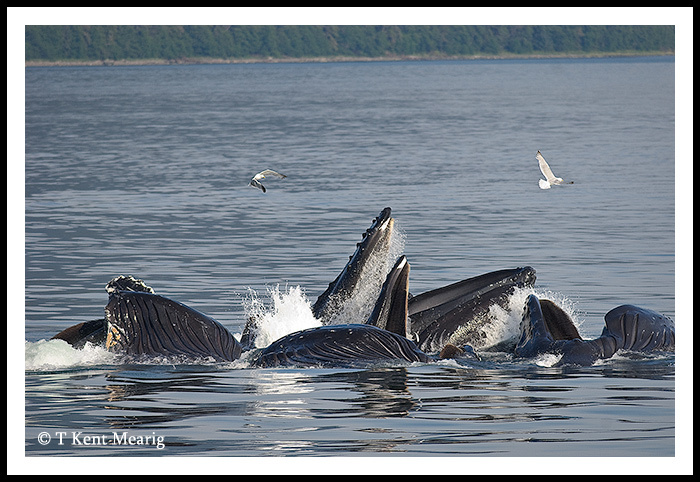 The entire school is trapped, and finally, each whale flashes the white undersides of their pectoral fins, which causes the school of herring to break off in front of them into “bite size” groups. 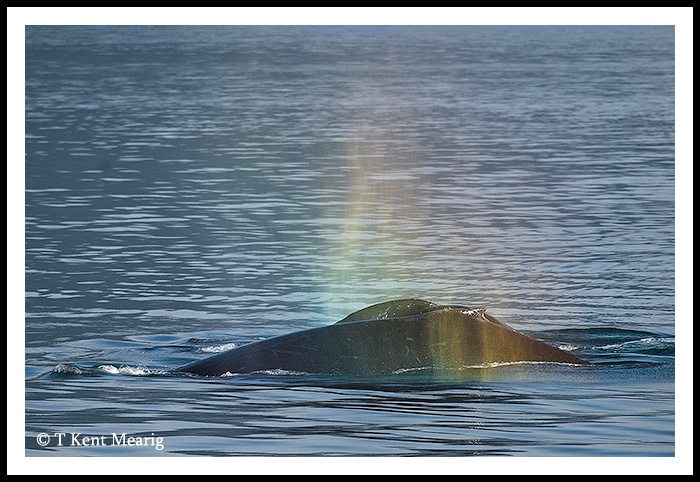 And is if that wasn’t enough, while the wales regrouped for yet another set of thousand gallon mouth fulls of water, they spouted rainbows. I was half expecting fairies riding unicorns to show up on the beach. Photographing from the ship was not without it’s challenges (especially whenever the engines were running), bu I was happy with the few sharp and well balanced images I managed. I could hardly believe the crew would be willing to leave when it was time to head back to the dock, but the real tourists did have cruise ships to catch. 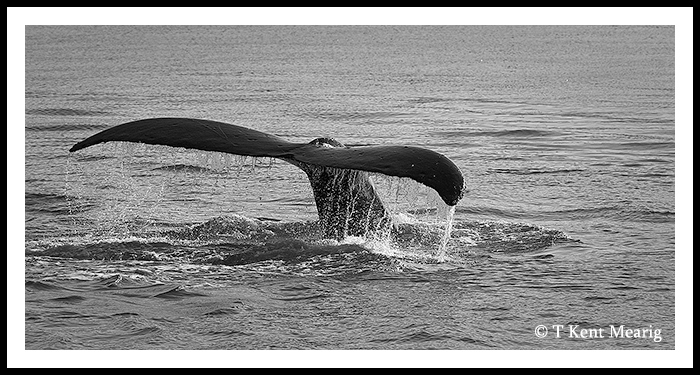 I thought about filling out one of their suggestion cards by saying, “Never, never, never leave bubble netting humpbacks!” Breea and I had an absolute blast, and we want to send out a big thank you to Julie for hooking us up with seats on the perfect day! I’m jealous – that must have been a blast! Good stuff.